Beyond its comprehensive programming, its balance of physical and digital events, the quality of venues and technical aptitude, Pause Fest was a success largely because it understood its audience. Co-founder George Hedon has spent the last 12 months building Pause in the hours around his full-time job, which just happened to suit the hours of his greatest supporters. “We have received so much interest internationally – working with Vimeo who were really excited, the guys at Soundcloud, contributions from amazing talent – but it was so difficult to stir up any interest in Australia.” This is testament to the cult of motion – the community is at its strongest online – self-publishing, working, exploring – the spirit of participation and sharing is indifferent to borders. Pause Fest celebrated this exchange but the successes it enjoyed could have been greater, the pressure on it’s sacrificial organisers lessened, with a show of imagination from its host city. For anyone outside motion, a limited involvement of Pause Fest could feel like watching show reels in a cinema, and I occasionally struggled to stay interested in what appeared to be the same level of talent and slick commercial work being produced around the world. But for a motion designer, to be able to immerse yourself in industry talks, screenings curated by the likes of Motiongrapher and Gestalten TV, installations of local and international talent, along with digital artifacts like Transparent TV, (and the three closing parties), Pause functioned as an exhaustive networking and learning experience. And in its future, as it makes its mark on a resistant Melbourne, it has the potential to turn into our very own smaller and niche OFFF. 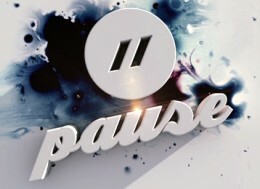 Thumbnail: Still from Dima Grubin’s intro for Pause Fest. desktop is relaunching and you’re invited!